With the advent of the internet and our use of an innovative automated underwriting engine, the home loan process has never been easier. Here at Close Your Own Loan.com we have streamlined the process to just a few simple steps. No more longwinded sales pitches to endure, no more calling all over town to get a simple rate quote, no more bait and switch techniques by unlicensed Loan Officers and no more high pressure sales tactics . You will be amazed by how easy it is to Close Your Own Loan. Click Get Rates, enter your basic loan details and view your interest rate and payment savings. You will be able to quickly and easily view your new 30 year fixed rate, monthly payment and total savings as well as view different loan programs if you wish. Once you have chosen your loan program and interest rate, click on Select Interest Rate And Go To Application. You will then be asked to create an account. Once you have chosen a login and password, you will be directed to the full loan application section where you will complete your loan application using our secure server with encryption technology. It usually only takes 5 minutes to complete the application and you will know the information that is needed off the top of your head. No need to gather bank statements or W2 forms just yet. Once you have completed your application, click Submit Application and Print Disclosures. This will send your completed loan application securely to one of our expert Processors. This will also provide you with all of your loan disclosures as well as an Items Needed Letter detailing what is needed from you. A copy of these disclosures will also be e-mailed to you along with your Loan Coordinator and Processor’s contact information. Keep in mind that you will be able to view this information at any time by logging in to your secure personal account. You now must gather the basic information from the Items Needed Letter and fax it along with your signed disclosures to your Loan Coordinator. Originals are not necessary. A faxed copy is fine. Once we receive your application, disclosures and items needed, your experienced Processor will submit your loan application to the automated underwriting engine. This automated underwriter will issue an underwriting decision detailing what is necessary to complete the transaction. Once this decision is issued, your Processor will order an appraisal from one of our preferred appraisers. The appraiser’s contact information will be e-mailed to you and the appraiser will contact you within 24 hours to set up an appointment. Once the appraisal has been received, your Processor will submit your loan for final approval. The final underwriting decision will be issued within 48-72 hours. Once the final approval is received from underwriting, your Processor will review any additional items required so we can draw your final loan documents for signing. Once the final loan documents have been drawn, an estimated closing statement will be e-mailed to you for your review. This closing statement will detail all of the distributions to be made through the loan as well as any cash to you. A notary will contact you to schedule a time to bring the loan documents to your home or office to complete the signing at your convenience. Once we have received the signed loan documents back, your loan will be put in line for funding. Once your loan funds and records, a final closing statement will be sent to you and the proceeds of the loan will be disbursed. It’s amazing that a process that can take 6-8 weeks or longer at other mortgage companies has been simplified to just a few simple steps by Close Your Own Loan.com. Remember, you can check the status of your loan at any time by simply logging into your secure account. Isn’t it great to be a part of the internet age?! 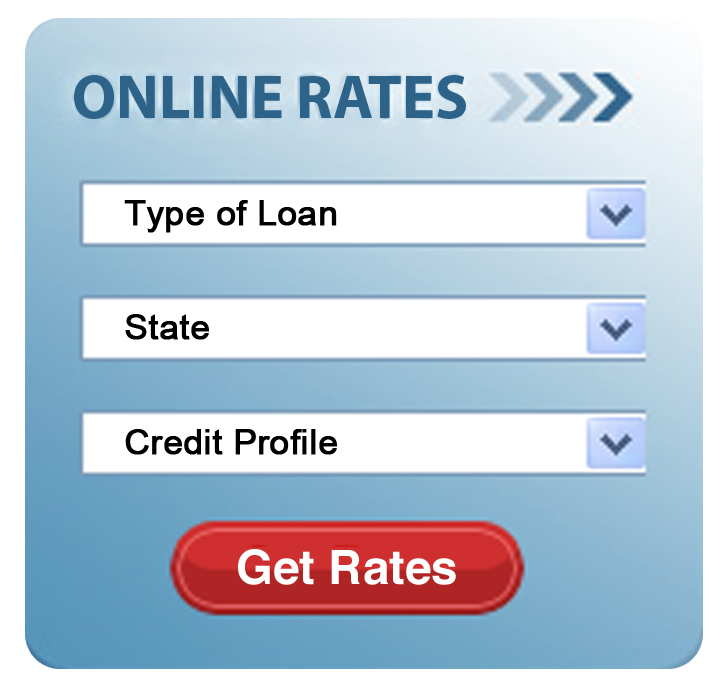 Click Get Rates to instantly view your new interest rate and payment.